Gluten-Free Blueberry Muffins that are bursting with blueberries and lemon zest. With only ten ingredients, and two bowls, you can have these gluten-free blueberry muffins rising in the oven. You are going to love these gluten-free muffins! 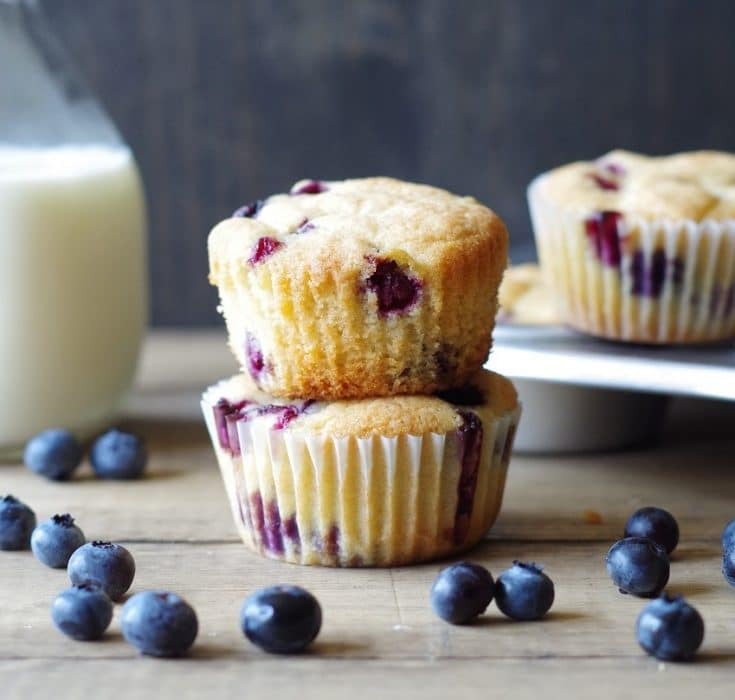 Did you know that you can bake gluten-free blueberry muffins with fresh or frozen blueberries? I prefer to freeze fresh blueberries because I feel like frozen blueberries hold shape better when baking when they’re frozen. Every year we pick loads of blueberries from our backyard. I planted six plants a few years back, and every year since we’ve gotten enough blueberries that we haven’t purchased any from the stores. We pick an average of two cups a day during the summer. For a family of four, that’s more than plenty. 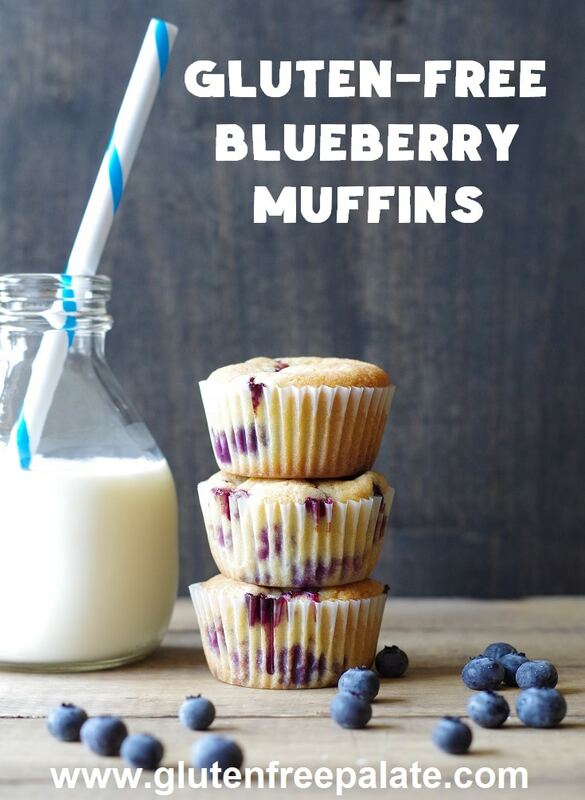 We enjoy half fresh, then freeze the rest for smoothies and baking treats – like Gluten-Fee Blueberry Muffins. Can I freeze gluten-free blueberry muffins? Yes, you can freeze gluten-free blueberry muffins. Make sure to wait until they come to room temperature before you place them in an airtight container in the freezer. I find gluten-free muffins to last about 4 days in an airtight container, assuming they aren’t devoured sooner. Gluten-free Blueberry Muffins are one of our favorite gluten-free muffins and they have been a breakfast choice for us for years. I don’t know who decided to put blueberries into a gluten-free muffin, but they are my hero. I love biting into a tender gluten-free muffin that is lightly sweetened and bursting with blueberries. Add in some lemon zest, for a citrus twist, and you have the perfect gluten-free blueberry muffin. If you are looking for a grain-free blueberry muffin I have Paleo Blueberry Muffin recipe you might like. Also, you can search for specific recipes and more gluten-free muffin recipes using the search bar on the side of the page. 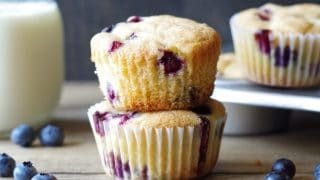 Can I make gluten-free blueberry muffins using regular milk and butter? 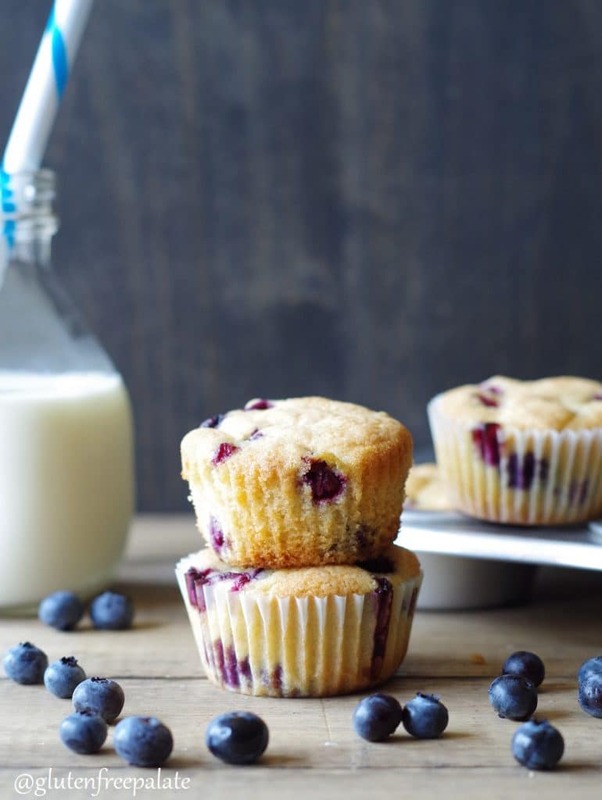 Yes, you don’t have to make these gluten-free blueberry muffins dairy-free. 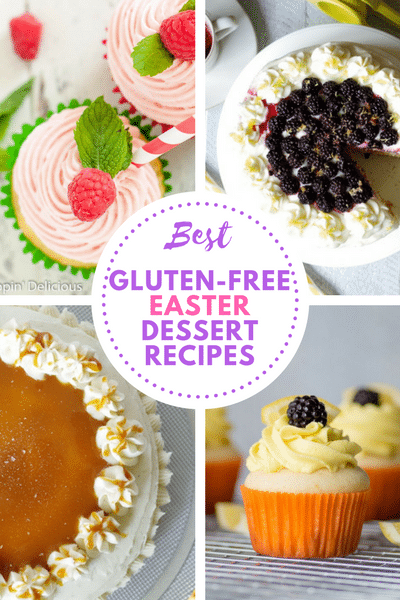 Like most of my gluten-free muffin recipes you can use dairy milk, and dairy butter. 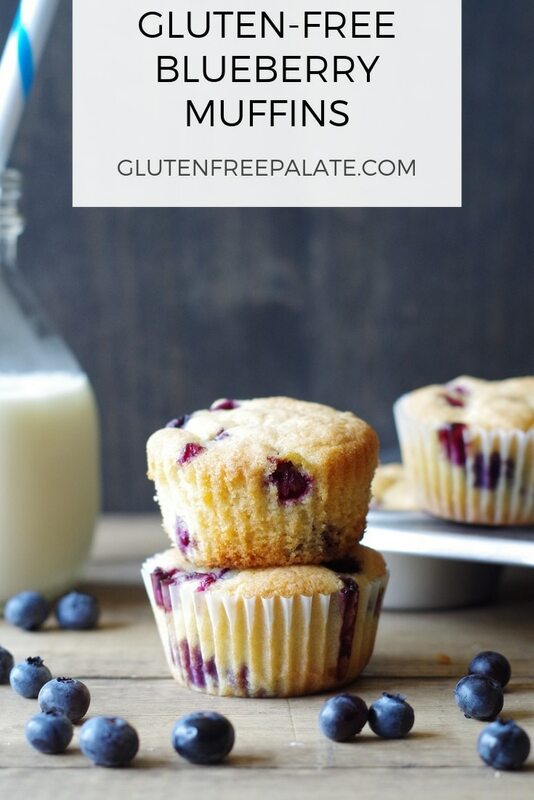 How do I make gluten-free blueberry muffins egg-free? I haven’t tried a egg replacer in this recipe, but you might like Beaming Bakers Gluten-Free Vegan Blueberry Applesauce Muffins. 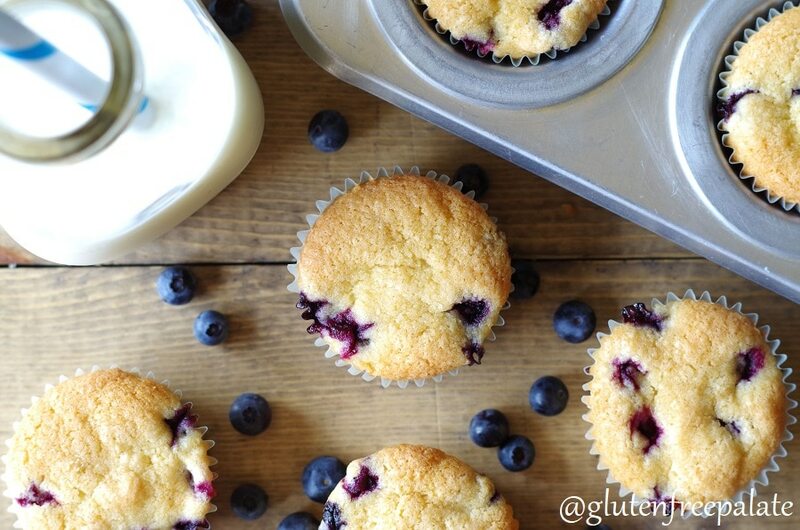 What other flour blends can I use to make gluten-free blueberry muffins? I like to you my own gluten-free flour blend recipe, but you can also use Ryze gluten-free flour, or Bob’s Red Mill 1-to-1 gluten-free flour blend. Like I mentioned above, you can use fresh blueberries in this gluten-free blueberry muffin recipe, but I recommend freezing your blueberries first. It helps to keep them from exploding in the muffin (unless you want them to explode, which is fine, just messy). Preheat the oven to 350°F (180°C). Line a muffin tin with papers; set aside. In a large mixing bowl, cream the dairy-free butter and sugar with an electric mixer. Add vanilla and lemon zest and mix until combine. In a separate medium mixing bowl, whisk the flour, salt and baking powder. Add to the wet mixture, alternately with the dairy-free milk. Fill each paper liner about 2/3rds full. Bake for 30-35 minutes, or until the center is set. Remove from the oven and let cool for 10 minutes before transferring to a wire rack to cool completely. Store in a container for up to 4 days at room temperature. Gluten-free blueberry muffins don’t last long in my house. My girls eat them two at a time, and with four of us, over half the batch is gone in minutes. If you like to make gluten-free muffins, check out my Gluten-Free Double Chocolate Muffins, Paleo Chocolate Chip Muffins, and Gluten-Free Mocha Muffins. All are super tasty. 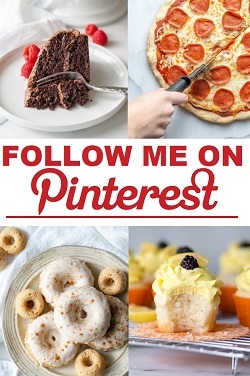 Looking for a cake recipe? Nicole from Allergylicious has an incredible recipe for Blueberry Lemon Snack Cake that includes delicious coconut. If you make these gluten-free blueberry muffins please stop back by and let me know what you thought. 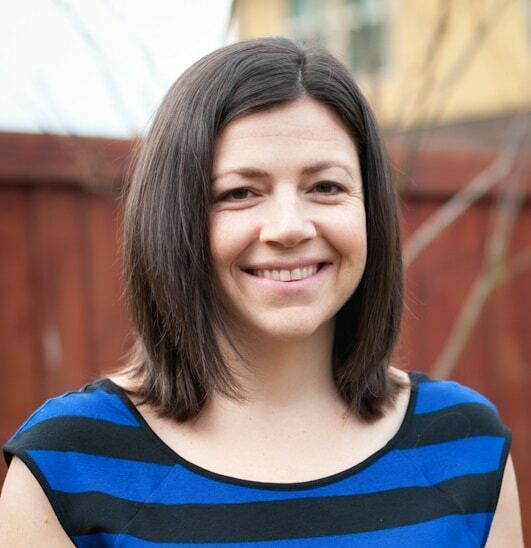 If you have a question, leave a comment below and I will get back to you. 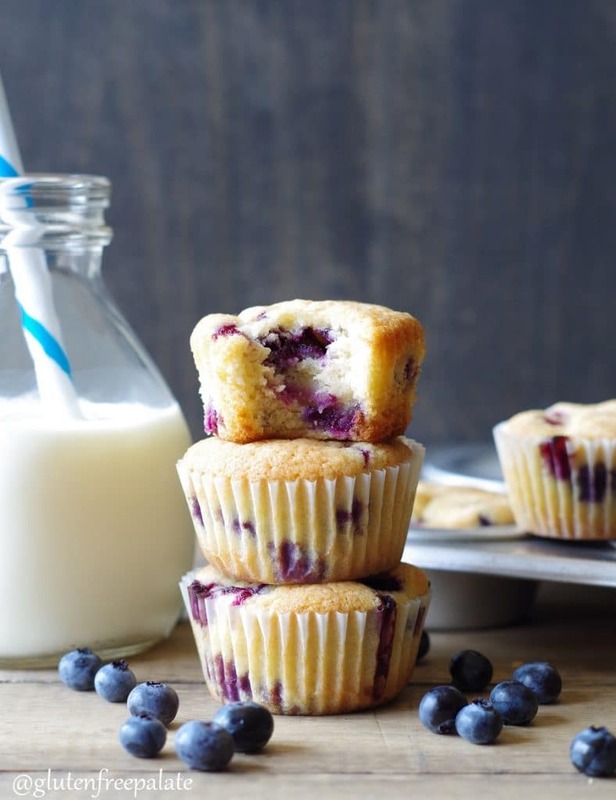 Gluten-free blueberry muffins that are easy to make. Dairy-free option included. Wow, wonderful, so tasty. My only exchange was honey for sugar. But they turned out nice and fluffy. Thank you. My daughter ate all of them already. I’m out of blueberries and trying strawberries next, will let you know. They smell good going in. Can you replace butter for coconut oil? thanks! I haven’t tried it in this recipe. If you do, please come back and let me know how it turned out! Can you reduce the sugar in the recipe to perhaps half cup brown sugar to use less sugar with a rich taste? Yes, you can use 1/2 cup brown sugar in this recipe. Just a note, the muffins may darken quicker because of the brown sugar. Let me know what you think!